K12 Online Conference Next Week! In a week, the second annual K12 Online Conference begins, and it’s the talk of the edublogosphere right now. I’m very excited to about it and am really looking forward to some thought-provoking addresses and conversations as the conference gets started. The organizers have asked that we spread the word about the conference by stating our 3 reasons for participating. See Wesley Fryer’s original meme post here. 1. It’s fantastic to have this access to so many people that are thinking about the same things I am these days as I try to create a 21st Century Library for my students & teachers. What an opportunity–and it’s free! 2. 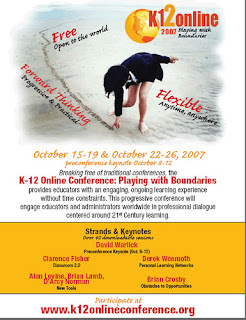 The learning from this conference can go on all year long (or longer) through the archives, wikis, discussions on the K12 Online Conference site. If I get swamped in the middle of the conference (I hope I won’t! ), I can pick up where I need to. If I want to hear a presentation again, it’s available! Powerful. 3. This conference fits my learning needs & interests right this minute better than what I have available to me locally. “Just in time” learning, I hope. To further this meme, I am tagging the other participants in my district’s Library2.0 Cohort. Maybe they’ll tag some of the rest of our friends! Thanks so much for tagging me. I had seen this, but as usual, you were the one who did something about it. You are a blessing to me. You are always right there, nudging me forward.